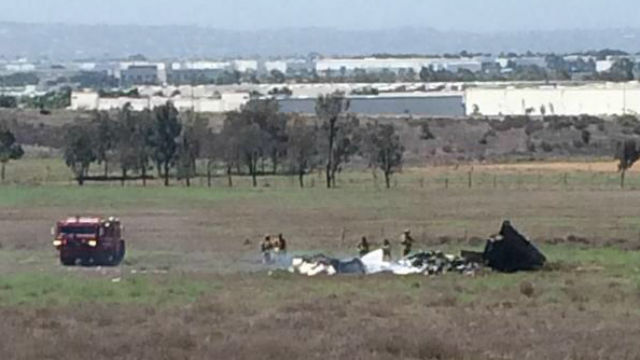 Authorities on Tuesday publicly identified a 55-year-old pilot killed along with four other men last weekend when a light plane and a business jet collided over Otay Mesa. Michael Copeland of San Diego was the sole occupant of a Cessna 172 that crashed into a twin-engine Sabreliner business jet while the two aircraft were on approach to Brown Field Municipal Airport shortly after 11 a.m. Sunday, according to the Federal Aviation Administration. The Cessna went down in an open-space preserve east of state Route 125, and the wreckage of the Sabreliner ended up west of Harvest Road. All five victims died at the scene of the accident, which left aircraft wreckage strewn across a field near R.J. Donovan Correction Center and sparked several brush fires. Also killed were BAE Systems employees John Kovach, Carlos Palos and Jeff Percy, all residents of the Kern County town of Mojave, according to the defense contracting company. They were taking part in a customer training project at the time of the crash. The fourth man in the jet was a contract employee who also was working for the firm. His name has been withheld pending family notification. Investigators with the National Transportation Safety Board are working to determine the cause of the accident.